This particular passage has always been a comfort to me. There is something reassuring to know that my God has undergone everything that mortal man must face- that he was our “brethren in every respect.” God is not asking us to do anything that He Himself would not do, or to face anything He would not face, or to suffer anything that He would not suffer. We are not the first to walk the path of life- we are merely following in His footsteps. A trailblazer has gone ahead of us and marked the path for us. And for me at least, that is a comforting notion. When all the kings who were beyond the Jordan in the hill country and in the lowland all along the coast of the Great Sea toward Lebanon, the Hittites, the Amorites, the Canaanites, the Per′izzites, the Hivites, and the Jeb′usites, heard of this, 2 they gathered together with one accord to fight Joshua and Israel. 3 But when the inhabitants of Gibeon heard what Joshua had done to Jericho and to Ai, 4 they on their part acted with cunning, and went and made ready provisions, and took worn-out sacks upon their asses, and wineskins, worn-out and torn and mended, 5 with worn-out, patched sandals on their feet, and worn-out clothes; and all their provisions were dry and moldy. 6 And they went to Joshua in the camp at Gilgal, and said to him and to the men of Israel, “We have come from a far country; so now make a covenant with us.” 7 But the men of Israel said to the Hivites, “Perhaps you live among us; then how can we make a covenant with you?” 8 They said to Joshua, “We are your servants.” And Joshua said to them, “Who are you? And where do you come from?” 9 They said to him, “From a very far country your servants have come, because of the name of the Lord your God; for we have heard a report of him, and all that he did in Egypt, 10 and all that he did to the two kings of the Amorites who were beyond the Jordan, Sihon the king of Heshbon, and Og king of Bashan, who dwelt in Ash′taroth. 11 And our elders and all the inhabitants of our country said to us, ‘Take provisions in your hand for the journey, and go to meet them, and say to them, “We are your servants; come now, make a covenant with us.”’ 12 Here is our bread; it was still warm when we took it from our houses as our food for the journey, on the day we set forth to come to you, but now, behold, it is dry and moldy; 13 these wineskins were new when we filled them, and behold, they are burst; and these garments and shoes of ours are worn out from the very long journey.” 14 So the men partook of their provisions, and did not ask direction from the Lord. 15 And Joshua made peace with them, and made a covenant with them, to let them live; and the leaders of the congregation swore to them. 16 At the end of three days after they had made a covenant with them, they heard that they were their neighbors, and that they dwelt among them. 17 And the people of Israel set out and reached their cities on the third day. Now their cities were Gibeon, Chephi′rah, Be-er′oth, and Kir′iath-je′arim. 18 But the people of Israel did not kill them, because the leaders of the congregation had sworn to them by the Lord, the God of Israel. Then all the congregation murmured against the leaders. 19 But all the leaders said to all the congregation, “We have sworn to them by the Lord, the God of Israel, and now we may not touch them. 20 This we will do to them, and let them live, lest wrath be upon us, because of the oath which we swore to them.” 21 And the leaders said to them, “Let them live.” So they became hewers of wood and drawers of water for all the congregation, as the leaders had said of them. 22 Joshua summoned them, and he said to them, “Why did you deceive us, saying, ‘We are very far from you,’ when you dwell among us? 23 Now therefore you are cursed, and some of you shall always be slaves, hewers of wood and drawers of water for the house of my God.” 24 They answered Joshua, “Because it was told to your servants for a certainty that the Lord your God had commanded his servant Moses to give you all the land, and to destroy all the inhabitants of the land from before you; so we feared greatly for our lives because of you, and did this thing. 25 And now, behold, we are in your hand: do as it seems good and right in your sight to do to us.” 26 So he did to them, and delivered them out of the hand of the people of Israel; and they did not kill them. 27 But Joshua made them that day hewers of wood and drawers of water for the congregation and for the altar of the Lord, to continue to this day, in the place which he should choose. I am curious what the early Church fathers made of this passage. To me it seems to presage the admission of Gentiles into the ranks of the saved in the Acts of the Apostles. The Gibeonites knew that they faced destruction if they resisted the Israelites, so they chose to become servants instead. And in serving Israel they also served the Lord. In a way, this is true of Christians as well. We all face destruction on the one hand, but we can overcome this by subjecting ourselves to the authority of God. Yet we are more blessed then the Gibeonites, for we who so subject ourselves not only are spared, but are adopted into the Lord’s own family, and thus gain a share of the inheritance. 21 And Jesus went away from there and withdrew to the district of Tyre and Sidon. 22 And behold, a Canaanite woman from that region came out and cried, “Have mercy on me, O Lord, Son of David; my daughter is severely possessed by a demon.” 23 But he did not answer her a word. And his disciples came and begged him, saying, “Send her away, for she is crying after us.” 24 He answered, “I was sent only to the lost sheep of the house of Israel.” 25 But she came and knelt before him, saying, “Lord, help me.” 26 And he answered, “It is not fair to take the children’s bread and throw it to the dogs.” 27 She said, “Yes, Lord, yet even the dogs eat the crumbs that fall from their master’s table.” 28 Then Jesus answered her, “O woman, great is your faith! Be it done for you as you desire.” And her daughter was healed instantly. I suspect that most people have trouble with this particular narrative from the Gospels. At first blush it almost seems as though Jesus is cruel or unloving. But when you see this passage in light of the necessity of humility in holding to our faith, it makes sense. In emptying herself of value and worth, the Canaanite woman saves her daughter, and presumably herself. For what she has emptied, discarded or lowered about herself was of the world- status and a perception of how important we are in life. In its place she set faith, her faith in Jesus and His power. With this intent did Christ put her off, for He knew she would say this; for this did He deny the grant, that He might exhibit her high self-command. For if He had not meant to give, neither would He have given afterwards, nor would He have stopped her mouth again. But as He does in the case of the centurion, saying, I will come and heal him, Matthew 8:7 that we might learn the godly fear of that man, and might hear him say, I am not worthy that You should come under my roof; Matthew 8:8 and as He does in the case of her that had the issue of blood, saying, I perceive that virtue has gone out of me, Luke 8:46 that He might make her faith manifest; and as in the case of the Samaritanwoman, that He might show how not even upon reproof she desists: John 4:18 so also here, He would not that so great virtue in the woman should be hid. Not in insult then were His words spoken, but calling her forth, and revealing the treasure laid up in her. But do thou, I pray you, together with her faith see also her humility. For He had called the Jews children, but she was not satisfied with this, but even called them masters; so far was she from grieving at the praises of others. Do you see the woman’s wisdom, how she did not venture so much as to say a word against it, nor was stung by other men’s praises, nor was indignant at the reproach? Do you see her constancy? He said, It is not meet, and she said, Truth, Lord; He called them children, but she masters; He used the name of a dog, but she added also the dog’s act. Do you see this woman’s humility? Yea, therefore did He put her off, that He might proclaim aloud this saying, that He might crown the woman. Jesus did not demean the Canaanite woman- he instead gave her a chance to shine and demonstrate her virtue and worth. Saint Hubertus or Hubert (c. 656–727 A.D.) became Bishop of Liège in 708 A.D. He was a Christian saint who was the patron saint of hunters, mathematicians, opticians, and metalworkers. Known as the Apostle of the Ardennes, he was called upon, until the early 20th century, to cure rabies through the use of the traditional St Hubert’s Key. 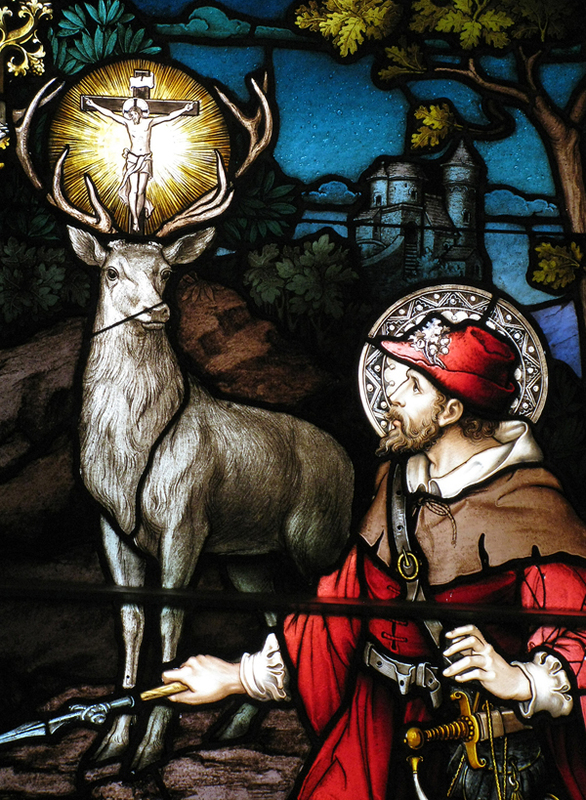 Saint Hubertus was widely venerated during the Middle Ages. The iconography of his legend is entangled with the legend of Saint Eustace. The Bollandists published seven early lives of Hubertus (Acta Sanctorum, November, i., 759–930 A.D.); the first of these was the work of a contemporary, though it is very sparing of details. He died 30 May 727 A.D. in Tervuren near Brussels, Belgium. His feast day is November 3. More can be found out about St. Hubertus at his wiki, located here. Or do you not know that all we who were baptized into Christ Jesus were baptized into His death? Were buried therefore with Him by our baptism into death, etc. 1. Rejoice, you heavens, and let the earth be glad , for those who are to be sprinkled with hyssop, and cleansed with the spiritual hyssop, the power of Him to whom at His Passion drink was offered on hyssop and a reed. And while the Heavenly Powers rejoice, let the souls that are to be united to the spiritual Bridegroom make themselves ready. For the voice is heard of one crying in the wilderness, Prepare the way of the Lord. Isaiah 40:3 For this is no light matter, no ordinary and indiscriminate union according to the flesh , but the All-searching Spirit’s election according to faith. For the inter-marriages and contracts of the world are not made altogether with judgment: but wherever there is wealth or beauty, there the bridegroom speedily approves: but here it is not beauty of person, but the soul’s clear conscience; not the condemned Mammon, but the wealth of the soul in godliness. 2. Listen then, O you children of righteousness, to John’s exhortation when he says, Make straight the way of the Lord. Take away all obstacles and stumbling-blocks, that you may walk straight onward to eternal life. Make ready the vessels of the soul, cleansed by unfeigned faith, for reception of the Holy Ghost. Begin at once to wash your robes in repentance, that when called to the bride-chamber you may be found clean. For the Bridegroom invites all without distinction, because His grace is bounteous; and the cry of loud-voiced heralds assembles them all: but the same Bridegroom afterwards separates those who have come in to the figurative marriage. O may none of those whose names have now been enrolled hear the words, Friend, how did you come in hither, not having a wedding garment Matthew 22:12? But may you all hear, Well done, good and faithful servant; you were faithful over a few things, I will set you over many things: enter thou into the joy of your lord Matthew 25:12 . For now meanwhile you stand outside the door: but God grant that you all may say, The King has brought me into His chamber. Song of Songs 1:4 Let my soul rejoice in the Lord: for He has clothed me with a garment of salvation, and a robe of gladness: He has crowned me with a garland as a bridegroom , and decked me with ornaments as a bride: that the soul of every one of you may be found not having spot or wrinkle or any such thing Ephesians 5:7; I do not mean before you have received the grace, for how could that be? Since it is for remission of sins that you have been called; but that, when the grace is to be given, your conscience being found uncondemned may concur with the grace. 3. This is in truth a serious matter, brethren, and you must approach it with good heed. Each one of you is about to be presented to God before tens of thousands of the Angelic Hosts: the Holy Ghost is about to seal your souls: you are to be enrolled in the army of the Great King. Therefore make you ready, and equip yourselves, by putting on I mean, not bright apparel , but piety of soul with a good conscience. Regard not the Laver as simple water, but rather regard the spiritual grace that is given with the water. For just as the offerings brought to the heathen altars , though simple in their nature, become defiled by the invocation of the idols , so contrariwise the simple water having received the invocation of the Holy Ghost, and of Christ, and of the Father, acquires a new power of holiness. 4. For since man is of twofold nature, soul and body, the purification also is twofold, the one incorporeal for the incorporeal part, and the other bodily for the body: the water cleanses the body, and the Spirit seals the soul; that we may draw near unto God, having our heart sprinkled by the Spirit, and our body washed with pure water. Hebrews 10:22 When going down, therefore, into the water, think not of the bare element, but look for salvation by the power of the Holy Ghost: for without both you can not possibly be made perfect. It is not I that say this, but the Lord Jesus Christ, who has the power in this matter: for He says, Unless a man be born anew (and He adds the words) of water and of the Spirit, he cannot enter into the kingdom of God. John 3:3 Neither does he that is baptized with water, but not found worthy of the Spirit, receive the grace in perfection; nor if a man be virtuous in his deeds, but receive not the seal by water, shall he enter into the kingdom of heaven. A bold saying, but not mine, for it is Jesus who has declared it: and here is the proof of the statement from Holy Scripture. Cornelius was a just man, who was honoured with a vision of Angels, and had set up his prayers and almsdeeds as a good memorial before God in heaven. Peter came, and the Spirit was poured out upon them that believed, and they spoke with other tongues, and prophesied: and after the grace of the Spirit the Scripture says that Peter commanded them to be baptized in the name of Jesus Christ Acts 10:48; in order that, the soul having been born again by faith , the body also might by the water partake of the grace. 5. But if any one wishes to know why the grace is given by water and not by a different element, let him take up the Divine Scriptures and he shall learn. For water is a grand thing, and the noblest of the four visible elements of the world. Heaven is the dwelling-place of Angels, but the heavens are from the waters : the earth is the place of men, but the earth is from the waters: and before the whole six days’ formation of the things that were made, the Spirit of God moved upon the face of the water. Genesis 1:2 The water was the beginning of the world, and Jordan the beginning of the Gospel tidings: for Israel deliverance from Pharaoh was through the sea, and for the world deliverance from sins by the washing of water with the word Ephesians 5:26 of God. Where a covenant is made with any, there is water also. After the flood, a covenant was made with Noah: a covenant for Israel from Mount Sinai, but with water, and scarlet wool, and hyssop. Hebrews 9:19 Elias is taken up, but not apart from water: for first he crosses the Jordan, then in a chariot mounts the heaven. The high-priest is first washed, then offers incense; for Aaron first washed, then was made high-priest: for how could one who had not yet been purified by water pray for the rest? Also as a symbol of Baptism there was a laver set apart within the Tabernacle. 6. Baptism is the end of the Old Testament, and beginning of the New. For its author was John, than whom was none greater among them that are born of women. The end he was of the Prophets: for all the Prophets and the law were until John Matthew 11:13: but of the Gospel history he was the first-fruit. For it says, The beginning of the Gospel of Jesus Christ, etc. : John came baptising in the wilderness. You may mention Elias the Tishbite who was taken up into heaven, yet he is not greater than John: Enoch was translated, but he is not greater than John: Moses was a very great lawgiver, and all the Prophets were admirable, but not greater than John. It is not I that dare to compare Prophets with Prophets: but their Master and ours, the Lord Jesus, declared it: Among them that are born of women there has not risen a greater than John Matthew 11:11: He says not among them that are born of virgins, but of women. The comparison is between the great servant and his fellow-servants: but the pre-eminence and the grace of the Son is beyond comparison with servants. Do you see how great a man God chose as the first minister of this grace?— a man possessing nothing, and a lover of the desert, yet no hater of mankind: who ate locusts, and winged his soul for heaven : feeding upon honey, and speaking things both sweeter and more salutary than honey: clothed with a garment of camel’s hair, and showing in himself the pattern of the ascetic life; who also was sanctified by the Holy Ghost while yet he was carried in his mother’s womb. Jeremiah was sanctified, but did not prophesy, in the womb Jeremiah 1:5: John alone while carried in the womb leaped for joy Luke 1:44, and though he saw not with the eyes of flesh, knew his Master by the Spirit: for since the grace of Baptism was great, it required greatness in its founder also. Its been quite a while since I last wrote one of these posts, and thus it is long overdue. I’m going to cover some important links, relate a few of my thoughts and preview a few possible post ideas in the future. To begin with, I wanted to give my readers a heads up that I am going to refrain from commenting at other blogs for the near future. I have not been pleased with my comments for a while. None have been good, much less great, and many were sub-par. Given the trouble that a few have caused me, I’m going to hold off with them for the moment, although I will still comment here. Part of my problem is that when I comment I usually write in haste, which does not lend itself well to careful thought or careful writing. So expect to see very little of me around for the time being. Do women have the ability to agape love their husbands? There are no commands for women to agape love their husbands but to philea love them (Titus 2). Do women have full moral agency? Are women able to act as their own agent outside of men: what about the fact that women were under their fathers in the OT, and confirmed through 1 Cor 7 to also be under the authority of their fathers prior to marriage? While others have provided good commentary, there are a few things I wanted to note. First, just because scripture doesn’t command it doesn’t meant that women don’t have the ability to agape love their husbands. Scripture contains what is essential, surely, but it doesn’t contain everything- it cannot, in fact. That is why Jesus gave us the Church, after all- for continued wisdom and guidance. Second, concerning moral agency, I think Deep Strength is conflating moral agency- the ability to choose between right and wrong- with [edit: potential or alleged] female susceptibility to deception. They are not incompatible. Women can choose to do the right thing, just as they can choose to do the wrong thing. Deception merely makes it more difficult to discriminate between the two. Third, women are indeed able to operate as agents outside of the authority of men. Scripture mentions ta number of instances of it, in both the OT and NT. However, that doesn’t mean it is necessarily for the best, at least, all the time. This ties again to the susceptibility of deception- protecting women from deception probably had a large part to do with that. There might be more, of course, and this could be a subject worth exploring in a further post. Elspeth has closed up shop, although she might comment from time to time. So has Mrs. ktc. Both are going to be moved to my inactive section shortly. Empath talks about the subtle power of examples. Stingray has a new blog focused on religious discussions. Ballista provides yet another example of how conservatives either don’t get it, or pretend not to get it when it comes to marriage. Bonald has an interesting post, among a great many, which discusses inter-species romance. I mention this one specifically because James T. Kirk is involved. Free Northerner explores the potential Selection Effects of War. I agree with Beefy Levinson that enemies are easy to deal with, it is your treacherous friends that are the problem. Related: Rebellion at a Catholic High School. I hope the admin stands firm. Mrs. C. had an interesting post on St. Patrick’s day which discussed welcoming sinners. I encourage my readers to read it, because I want to comment on it briefly. There is an interesting tension that the Church has endured since its creation between welcoming sinners, on one hand, and turning a blind eye to sin, on the other. Sometimes the Church has gone too far one way, and sometimes too far the other. I think that a major determinant of how the Church should act with regards to any given individual is determined by that person’s background. The way I see it, there are four sorts of backgrounds someone might have: 1) someone who was born to the faith and never left the church (although they might have strayed), 2) someone who wasn’t born to the faith but converted and is present still in the Church, 3) someone who was born to the faith but then left (prodigal son/daughter?) and 4) someone who wasn’t born to the faith and hasn’t converted before. Each needs to be treated somewhat differently. In brief, I would accord more leniency to persons from the latter backgrounds. The danger of too much leniency (or mercy) towards the former is that it might establish in the minds of the faithful the notion that eschewing sin is not an important or vital part of the faith. In other words, it acts as a stumbling block. This is less of an issue for someone who is coming to the Church for the first time, either ever or for a long time. Vox brings a story of how Little girls need fathers. As I was writing this post Rollo put up a new post of his own, where he delves into the subject of “Betas in Waiting.” His efforts in examining the different “stages” of the life of most modern women have provided me with a lot of insights. Some of them will come into play in a future post of mine examining male and female “Sexual Strategies”, and how they interact with one another. 42 As they went out, the people begged that these things might be told them the next sabbath. 43 And when the meeting of the synagogue broke up, many Jews and devout converts to Judaism followed Paul and Barnabas, who spoke to them and urged them to continue in the grace of God. 48 And when the Gentiles heard this, they were glad and glorified the word of God; and as many as were ordained to eternal life believed. 49 And the word of the Lord spread throughout all the region. 50 But the Jews incited the devout women of high standing and the leading men of the city, and stirred up persecution against Paul and Barnabas, and drove them out of their district. 51 But they shook off the dust from their feet against them, and went to Ico′nium. 52 And the disciples were filled with joy and with the Holy Spirit. I chose this passage thanks to a discussion I had recently with a deacon about the evangelical work of St. Paul. He explained that most synagogues would have been relatively small, and everyone would have known everyone else. So it would have been apparent when visitors were present. Often it was practice to have the visitors introduce themselves and say a few words. Paul, being a former Pharisee, probably still dressed as one. So those present would have seen that he was likely an expert of the Law and would have been eager to hear what he had to say. This is why he was given the opportunity to speak up and to explain to the Jews at the Synagogue the Good News. God created us man and woman, each of us with noble work in mind. Some of the work will be the same, and some different. But all is worthy if made in service to the Glory of God. What is unfortunate is that most of the time the truth is given to us plainly, and yet we refuse to accept it. We are either too committed to what we have believed for a long time, to our preconceived notions, or we refuse to embrace the truth because it requires more of us than we are willing to give. When we are given that truth, let us not follow in the footsteps of those disciples who turned back. Instead, let us recognize that we have no others to whom we can go. Only One is the source of eternal life. Pope Gregory I (Latin: Gregorius I; c. 540 – 12 March 604), commonly known as Saint Gregory the Great, was Pope from 3 September 590 to his death in 604. Gregory is well known for his writings, which were more prolific than those of any of his predecessors as pope. He is also known as St. Gregory the Dialogist in Eastern Christianity because of his Dialogues. For this reason, English translations of Eastern texts will sometimes list him as “Gregory Dialogus”. Throughout the Middle Ages he was known as “the Father of Christian Worship” because of his exceptional efforts in revising the Roman worship of his day. His contributions to the development of the Divine Liturgy of the Presanctified Gifts, still in use in the Byzantine Rite, were so significant that he is generally recognized as its de facto author. He was the first of the popes to come from a monastic background. Gregory is a Doctor of the Church and one of the Latin Fathers. He is considered a saint in the Catholic Church, Eastern Orthodox Church, Anglican Communion, and some Lutheran churches. Immediately after his death, Gregory was canonized by popular acclaim. The Protestant reformer John Calvin admired Gregory and declared in his Institutes that Gregory was the last good pope. He is the patron saint of musicians, singers, students, and teachers. 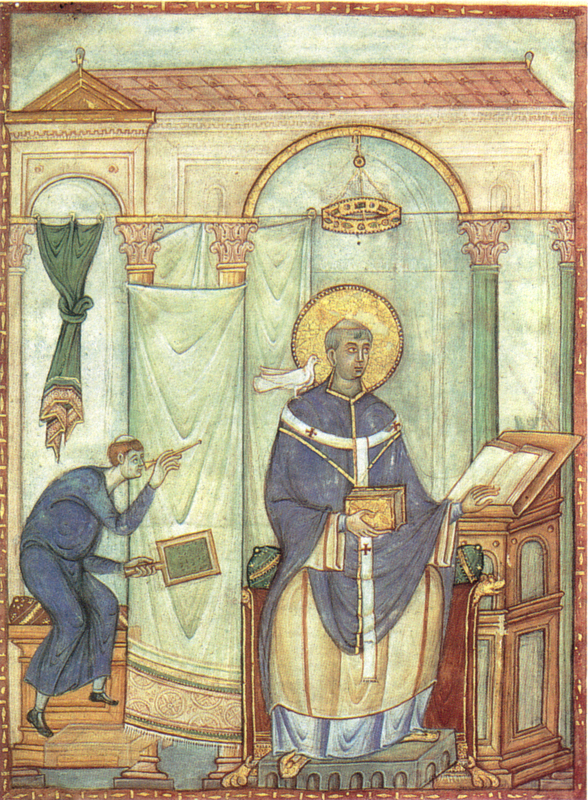 More can be found out about St. Gregory and his impact on the faith at his wiki, located here. 13. You see that it is good to make confession. You see that there is salvation for them that repent. Solomon also fell but what says he? Afterwards I repented. Ahab, too, the King of Samaria, became a most wicked idolater, an outrageous man, the murderer of the Prophets 1 Kings 18:4, a stranger to godliness, a coveter of other men’s fields and vineyards. Yet when by Jezebel’s means he had slain Naboth, and the Prophet Elias came and merely threatened him, he rent his garments, and put on sackcloth. And what says the merciful God to Elias? Hast than seen how Ahab is pricked in the heart before Me ? As if almost He would persuade the fiery zeal of the Prophet to condescend to the penitent. For He says, I will not bring the evil in his days. And though after this forgiveness he was sure not to depart from his wickedness, nevertheless the forgiving God forgave him, not as being ignorant of the future, but as granting a forgiveness corresponding to his present season of repentance. For it is the part of a righteous judge to give sentence according to each case that has occurred. 15. Take heed lest without reason you mistrust the power of repentance. Would you know what power repentance has? Would you know the strong weapon of salvation, and learn what the force of confession is? Hezekiah by means of confession routed a hundred and fourscore and five thousand of his enemies. A great thing verily was this, but still small in comparison with what remains to be told: the same king by repentance obtained the recall of a divine sentence which had already gone forth. For when he had fallen sick, Esaias said to him, Set your house in order; for you shall die, and not live. 2 Kings 20:1 What expectation remained, what hope of recovery, when the Prophet said, for you shall die? Yet Hezekiah did not desist from repentance; but remembering what is written, When you shall turn and lament, then shall you be saved Isaiah 30:15, he turned to the wall, and from his bed lifting his mind to heaven (for thickness of walls is no hindrance to prayers sent up with devotion), he said, Remember me, O Lord, for it is sufficient for my healing that You remember me. You are not subject to times, but art Yourself the giver of the law of life. For our life depends not on a nativity, nor on a conjunction of stars, as some idly talk; but both of life and its duration. Then art Yourself the Lawgiver according to Your Will. And he, who could not hope to live because of the prophetic sentence, had fifteen years added to his life, and for the sign the sun ran backward in his course. Well then, for Ezekias’ sake the sun turned back but for Christ the sun was eclipsed, not retracing his steps, but suffering eclipse Isaiah 38:8, and therefore showing the difference between them, I mean between Ezekias and Jesus. The former prevailed to the cancelling of God’s decree, and cannot Jesus grant remission of sins? Turn and bewail yourself, shut your door, and pray to be forgiven, pray that He may remove from you the burning flames. For confession has power to quench even fire, power to tame even lions. 17. What do you think of Nabuchodonosor? Have you not heard out of the Scriptures that he was bloodthirsty, fierce , lion-like in disposition? Have you not heard that he brought out the bones of the kings from their graves into the light ? Have you not heard that he carried the people away captive? Have you not heard that he put out the eyes of the king, after he had already seen his children slain 2 Kings 25:7? Have you not heard that he broke in pieces the Cherubim? I do not mean the invisible beings—away with such a thought, O man —but the sculptured images, and the mercy-seat, in the midst of which God spoke with His voice. The veil of the Sanctuary he trampled under foot: the altar of incense he took and carried away to an idol-temple 2 Chronicles 36:7: all the offerings he took away: the Temple he burned from the foundations. How great punishments did he deserve, for slaying kings, for setting fire to the Sanctuary, for taking the people captive, for setting the sacred vessels in the house of idols? Did he not deserve ten thousand deaths? 18. You have seen the greatness of his evil deeds: come now to God’s loving-kindness. He was turned into a wild beast , he abode in the wilderness, he was scourged, that he might be saved. He had claws as a lion ; for he was a ravager of the Sanctuary. He had a lion’s mane: for he was a ravening and a roaring lion. He ate grass like an ox: for a brute beast he was, not knowing Him who had given him the kingdom. His body was wet from the dew; because after seeing the fire quenched by the dew he believed not. And what happened ? After this, says he, I, Nabuchodonosor, lifted up my eyes unto heaven, and I blessed the Most High, and to Him that lives for ever I gave praise and glory. Daniel 4:34 When, therefore, he recognised the Most High , and sent up these words of thankfulness to God, and repented himself for what he had done, and recognised his own weakness, then God gave back to him the honour of the kingdom. 19. What then ? When Nabuchodonosor, after having done such deeds, had made confession, did God give him pardon and the kingdom, and when you repent shall He not give you the remission of sins, and the kingdom of heaven, if you live a worthy life? The Lord is loving unto man, and swift to pardon, but slow to punish. Let no man therefore despair of his own salvation. Peter, the chiefest and foremost of the Apostles, denied the Lord thrice before a little maid: but he repented himself, and wept bitterly. Now weeping shows the repentance of the heart: and therefore he not only received forgiveness for his denial, but also held his Apostolic dignity unforfeited.